Canada is honoring a prolific commercial illustrator responsible for the covers of more than 500 Harlequin romance novels—specifically, with a postage stamp. CBC News reported on the tribute to Will Davies, who also worked on advertisements, magazines, fashion layouts, and even stamps throughout the mid and late 20th century. But his work for the romance powerhouse—which was originally a Toronto-based company—stands out. 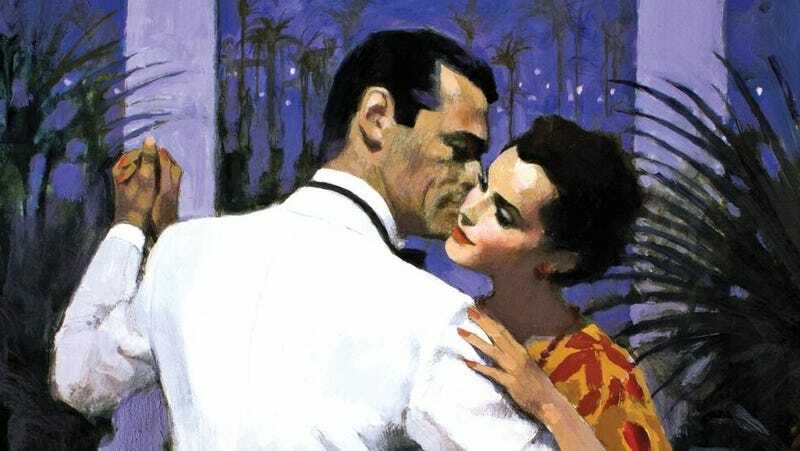 Until fairly recently in the genre’s history, each book got its own illustrated cover, and the distinctive art was an important part of creating the famous, globally powerful Harlequin brand, conjuring a sense of glamour and adventure. And, “during the course of his over 50-year career, Davies was what his daughter called a ‘go-to’ illustrator with authors often requesting that he be the one to design their covers,” CBC News explained. Canada Post is also honoring illustrators Blair Drawson, Gérard DuBois, James Hill, and Anita Kunz; “Canada has such a rich history in illustrators. It was very difficult to get this down to just five illustrators and then to get down to the illustration featured on each stamp,” said director of stamp services Jim Phillips. Here’s the stamp—which I will probably be driving to Canada to acquire, so I can frame it—in all its swoony glory.